With cooler weather, fewer crowds and breathtaking fall colors, autumn is one of the best seasons to visit the mountains. NOC Gatlinburg offers a variety of land- and water-based activities in the fall, so choose your adventure and head outside this fall! 1. Guided Hikes - Team up with an NOC Guide and explore the trails of the Smoky Mountains. Your guide will share information about the history of the park and local flora and fauna while leading you to the park's best areas. 2. Discover River Kayaking - Looking to learn a new skill this fall? Hit the river to learn the basics of whitewater kayaking with the best instructors in the nation! 3. Pigeon River Rafting - View the beautiful Fall scenery from the river! Raft the Upper Pigeon for a fun splashy adventure through class II-IV rapids or relax on the Lower Pigeon during a family-friendly float trip. 4. NOC Gatlinburg Store - Although not outside, this outdoor mega store features all of the gear, apparel and equipment that you need to have an adventure. Our guides will teach you about the gear and how to use it so you are ready for your trip. 5. NOC Mountaintop Zip Line Tour - If you're up for an excursion, take a short drive to NOC's Nantahala River Campus to experience the premier zip line adventure in the Southeast. NOC's Mountaintop Zip Line Tour features breathtaking, 360-degree views with almost all lines above the treetops. This tour gives you amazing views no matter what the season, but the fall vista is truly unforgettable. 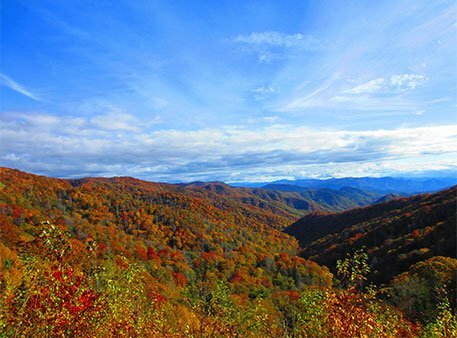 If visiting Gatlinburg this fall, be sure to check out some of these favorite activities. There's no better way to experience the changing of seasons than with a little outdoor adventure!